(Kansas City, Mo. – July 3, 2017) The Kansas City Area Transportation Authority will hold several public meetings to discuss proposed service changes. Changes would affect routes serving Kansas City, Mo., in October 2017. The changes and reductions will improve the effectiveness and efficiency of transit service. At the meetings, KCATA staff will explain the proposed changes, and provide an opportunity for customers to ask questions and comment at each meeting. Draft schedules and maps will be available at the meetings. It is not necessary to attend the entire meeting in order to comment. Thursday, July 6, 4 p.m. to 6 p.m., Waldo Library, Meeting Room A 201 E 75th St., Kansas City, Mo. Sunday, July 9, 2 to 4 p.m., Cleaver YMCA, 7000 Troost Ave. Kansas City, Mo. Monday, July 10, 11 a.m. to 1 p.m., Kansas City Design Center, 1020 Baltimore, Kansas City, Mo. Monday, July 10, 4 to 6 p.m., Dobbs Elementary School, 9400 Eastern Ave., Kansas City, Mo. Tuesday, July 11, 4 to 6 p.m., Plaza Library, 4801 Main Street, Kansas City, Mo. Customers may also submit comments by phone at 816-346-0300, by email at metro@kcata.org, or in writing to the Planning Department, KCATA, 1200 East 18th St., Kansas City, MO 64108. An online comment form is also available online. 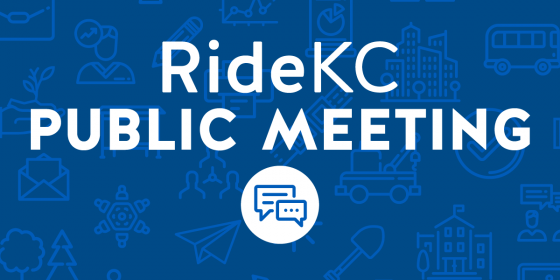 Two of the most significant changes affect RideKC’s MAX lines. KCATA proposes moving Main Street MAX service in downtown to Grand Boulevard faster service through downtown and to keep buses on time. Troost MAX and three other routes would extend to the new Three Trails Transit Center at Bannister and Blue Ridge. A summary of changes to each route is available at the website link above.